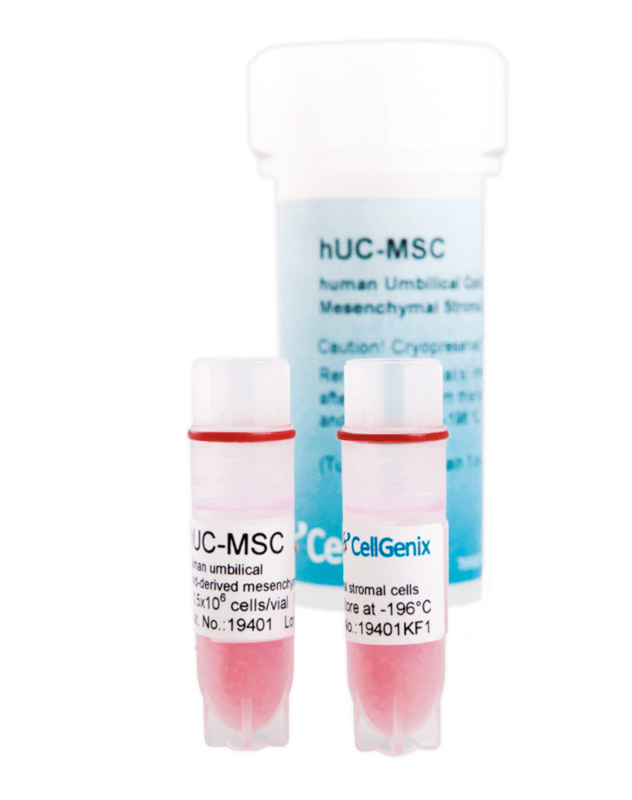 CellGenix human umbilical cord mesenchymal stem cells (hUC-MSC) are self-renewing cells that hold great therapeutic promise in the field of cell-based tissue engineering and regenerative medicine. They are used for the prevention or treatment of Graft versus Host Disease (GvHD) and as feeder cells for co-culturing of cord blood cells resulting in improved expansion of hematopoietic progenitors. CellGenix hUC-MSC are isolated from umbilical cord tissue by enzymatic digestion after removal of vessels. The cells are assayed for their expansion capacity, immune phenotype, and their potential to differentiate in vitro into adipogenic, osteogenic and chondrogenic lineages. Please note that this product is only available in Europe. Intended use For preclinical ex vivo use. Not intended for human in vivo application. Culture Culture in CellGenix MSC Medium containing 5 ng/ml CellGenix rh FGF-2. Please refer to the handling instructions for further thawing and cultivation details (on request).